b. ^ "Statistics Iceland:Key figures". Statistics Iceland. 1 October 2002. Retrieved 2011-07-02.
c. ^ "CIA – The World Factbook – Field Listing – Distribution of family income – Gini index". United States government. Retrieved 14 September 2008. آيسلندا هى دوله فى شمال اوروبا عاصمتها ريكياڤيك. عدد سكان ايسلاندا حوالى 320،000 و مساحتها الاجماليه 103،000 كم 2 (40،000 ميل مربع)، و ده بيخليها البلد الاقل كثافة سكانية ف أوروبا. 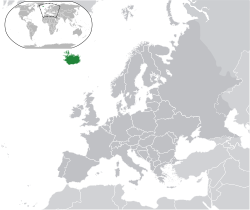 ↑ "Statistics Iceland – Statistics » Population » Population by origin and citizenship". Statice.is. Retrieved 2012-01-08. ↑ أ ب ت ث "Iceland". International Monetary Fund. Retrieved 2012-04-18. الصفحه دى اتعدلت اخر مره فى 6 فبراير 2018,‏ 16:48.